Obviously bath bombing is a fun and instagramable AF way to relax after a long day, but did you know they actually have a ton of benefits as well? It’s true! A nice hot bath combined with the right bath bomb can have some pretty amazing effects. Maybe you are feeling under the weather? Struggling with insomnia or anxiety? Want to score some glowing skin? Well, you’re in luck, there’s a bath for that! Let’s break it down. Stabilize your Mood - When you slip into a nice hot bath you probably notice an immediate sense of relaxation. This is because the warm water causes your veins to temporarily expand, lowering your blood pressure and allowing for that calming effect. When you add in a bath bomb loaded with essential oils you can create the perfect environment to lift your spirits and soothe your soul. Rest your head - If you struggle with insomnia or anxiety that makes it hard to fall asleep, a bath bomb might be your perfect solution. Oils like lavender and chamomile have a naturally calming effect allowing you to release built up tension in the mind and body. As an added bonus, when you emerge from the warmth or your bath and are greeted by a rush of cold air your body will actually release melatonin into your bloodstream. This will further relax your entire body, so you’ll probably want to have some cozy P.J’s nearby. Find your glow - Sitting in a warm bath increases your blood flow and opens up your pores. This alone will help to give your skin a beautiful and hydrated glow. It also allows for deeper absorption through your skin. This means that moisturizers, shower gels or HEY… Bath Bombs, will actually absorb quickly into your pores and taking their benefits up a notch. The ingredients in your bath bomb can clean and moisturize your skin, and the right combination of essential oils in your can even wake up dull tired skin, leaving you feeling absolutely radiant! Breath easy - When you combine the steam from a hot bath and the essential oils released from your bath bombs it creates a really beautiful aromatherapy experience. Oils like peppermint and orange have the power to jumpstart your day with just a few inhales, while oils like ylang ylang can soothe and relax you. Understanding essential oils and their benefits can really take your bath experience to new heights. Then all you have to do is a take a few deep breaths and let yourself sink into the water. Detox - Yes, the fizz and bubbles your bath bombs produce are hella fun, and It’s cool if that is your sole reason for enjoying them. But you should know, that the same ingredients that produce that fun effect actually can help to detox your body. Bonus! Citric acid and Sodium bicarbonate have the power to clean your skin while also replenishing moisture and have even been known to assist in repairing skin cells and strengthening blood vessels. So keep those bombs coming and say bye bye to toxins and hello to silky smooth skin. Fight a cold - For starters, the steam from that soothing hot bath you love so much has tons of benefits when fighting off a cold, even all on its own. It can help to open up your sinuses, relieve headaches and muscle pains, and reduce inflammation. Plus, when you add in the aromatherapy, and detoxifying benefits of a bath bomb you can really speed up the relief. Soothe your body aches - After an intense workout or even a long day on your feet, a hot bath could be just the trick for soothing those sore muscles and aching bones. The warmth helps you to relax and release tension and when you submerge yourself into the water you actually reduce the amount of pressure on your muscles and bones that you are typically used to. This allows your body a bit of recovery time which is much needed. Essential oils like clove, rosemary, lavender and peppermint have amazing pain relief benefits and when added to your bath they can maximize your efforts to soothe all those aches and pains. So fill that tub up high and don’t be afraid to double up on your bath bombs. We would like to point out, that not all bath bombs are created equally. Unfortunately you can find some bath bombs that will cause more harm than good due to their unnecessary and damaging ingredients. 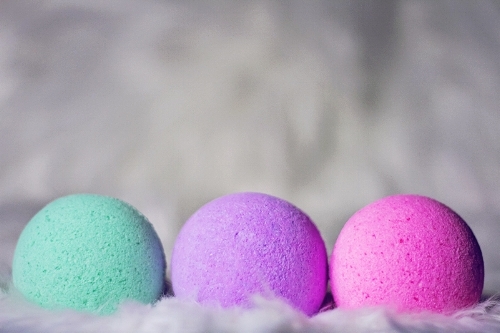 You bath Bombs should be made with natural ingredients, organic essential oils and coloring that is safe for your skin. That is why we highly suggest reading all of the ingredients prior to use. We may be a bit biased, but we love our Kush Queen bath bombs and put extra love and care into each one so that you can enjoy all of the benefits we’ve listed here today. Plus, the added CBD in each of our bombs will only improve upon these benefits. CBD can help to further the repair of skin cells, deepen the relaxation effects and assist in detoxing and fighting off those colds. It’s a win, win, win! It’s also important for us to note that you can have to much of a good thing. Over bathing and over using of bath bombs can reverse some of those positive effects and we don’t want that. We recommend incorporating bath bombing into your routine maybe 2 to 3 times a week. If you are feeling under the weather you may want to opt for an additional soak and that’s fine, but keep it within reason. If you start to notice your skin drying out, that may be a sign that you need to cut back a little. Listen to your body, it will tell you what you need. Don’t forget to let us know which Kush Queen bath bombs are your favorite and tag us in your photos @thekushqueens so we can see all of you beautiful queens taking care of yourself!